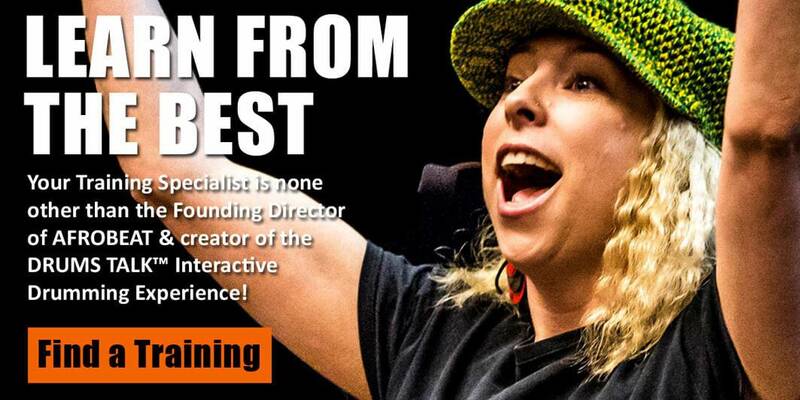 Become a DRUMS TALK Facilitator! Do what you LOVE, Inspire others, & Make a difference ...to the BEAT of the Drum! DRUMS TALK!™ is the ONLY Drum Facilitator Training to equip you with EVERYTHING you need to be successful, confident, and start right away. Whether you’re wanting to integrate the DRUMS TALK!™ program into your School, Community Group, Early Learning Centre, or Organisation; Build your community, Develop your Facilitator skills, Join our Team, or Start your own successful DRUMS TALK!™ business... we’re here to teach you how and support you all the way! One of the most inspiring, interactive group activities guaranteed to connect EVERYONE in the room within minutes, DRUMS TALK!™ is a tried and tested, successful interactive drumming formula designed, developed, and practiced over 20 years. With its limitless applications and adaptable format, DRUMS TALK!™ has the flexibility to resonate with diverse audiences and contexts, provide REAL outcomes and benefits; and allow you to specialise in your area of interest, passion or expertise. Get the ‘How to’ blue print for Interactive Group Drumming Success, giving you the confidence to get out there and present a successful and rewarding interactive drumming experience for ANY group. The DRUMS TALK!™ Drum Facilitator Training Basic 1 Course offers you the specialised tools, practice, and support you need to run a successful DRUMS TALK!™ program, start your own DRUMS TALK!™ business, or join our dynamic & talented Team! Got a Question about the Training? Get the tools you need to be a successful DRUMS TALK!™ Facilitator! Learn our responsive formula and how to harness the various elements to build an effective and flexible in-the-moment experience for participants. Get your Facilitator’s TOOLBOX™ started with everything you need to start Facilitating DRUMS TALK!™ right away – including ice breakers, musical activities, Facilitator language, interactive rhythmical content & More! Basic Rhythms ANYONE can play! Learn the DRUMS TALK!™ rhythms & how to break them down for anyone to play. We received great information out of the training, and great confidence in facilitating our own drumming sessions. Everyone enjoyed themselves over the weekend. Janine, as an instructor, you were such an inspiration to us all, in so many different ways. The workshop content and facilitation techniques were well-directed, as you were able to convey the information to us all, who were such a mixed group of people at all different levels of skills and abilities. It was lovely to meet you, you are truly an amazing and inspirational person! The school holidays have since commenced, and we have conducted two sessions on our own. I noticed that we have made great progress in our skills between the first and second week, and each week we are analysing what we can do to make the following week even better. By the second week, we were more confident in our facilitation skills, and had good support from the other facilitators. We noticed that the kids enjoyed playing alongside other adults from the community, and sharing the joy of making music with those that they aspire to. The program is building momentum with each week, and more community leaders are supporting troubled kids to build the courage to attend and participate. Steve and Adrielle, who attended the weekend workshop, are also gaining their own courage to facilitate in front of the group, and are keen to lead the group next week. The drumming program has been great at breaking down the communication barrier between police and community, and it provides a good situation where the community can approach police and ask questions in a non-confrontational setting. DRUMS TALK™ Facilitator Training welcomes participants of all experience levels including those with no facilitator, teaching, music, or entertainment experience. But let’s face it – personality; some musical, drumming, dance, or drama experience, and a ‘Go for it!’ attitude goes a long way! I’ve done other Drum Facilitator Trainings – Is this the same? This is like no other course out there! DRUMS TALK!™ is the ONLY Drumming Facilitator Training to equip you with EVERYTHING you need to be successful, confident, and start right away. We’re also the ONLY Drum Facilitator Training to equip you with the knowledge, skills, resources and SUPPORT to start your own drumming business – wherever you are! Why are we doing this? 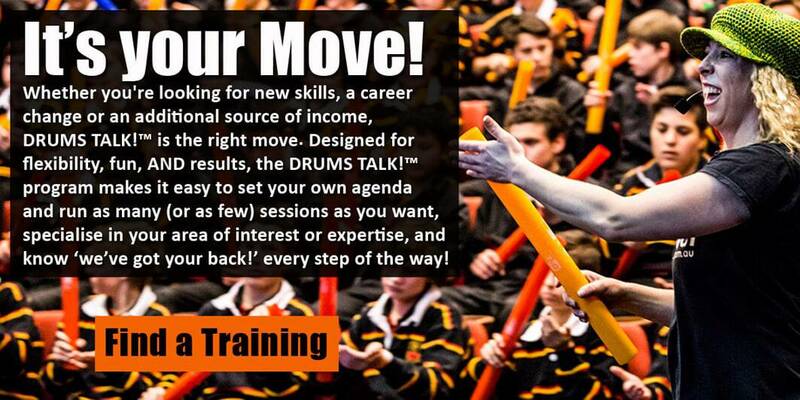 Because we want YOU to be successful, supported, and effective in your role as a DRUMS TALK!™ Facilitator. Are there any prerequisites to taking the DRUMS TALK!™ Facilitator training? Anyone 18 years or older may attend a DRUMS TALK!™ Facilitator Training. The Basic 1 Course is an entry level training so there are no prerequisites. However, it helps if you've already experienced DRUMS TALK!™ as a participant or if you have previous experience in teaching, facilitating, public speaking, drama, music or dance. You will be delighted to find out just how transferable these skills and experiences are, and be able to adapt it to what you learn at the training. DRUMS TALK™ Facilitator Training welcomes participants of all experience levels including those with no musical or teaching experience. You don't need to be the best drummer to be the best facilitator!